There’s a new ‘pot’ store in town — hmm…that’s ‘pot’tery store. 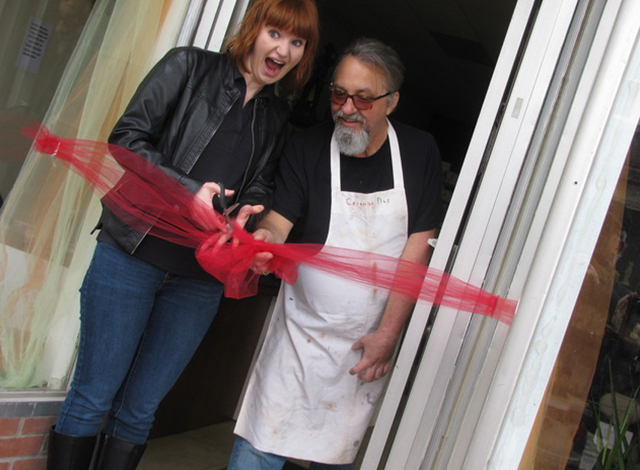 Gene Amell’s store — Simply Ceramics+ — opened with a ribbon-cutting, and cake and coffee for customers. The front half of the small space was crowded with curious visitors and well-wishers, while the back was filled with shelves of bisque figures waiting to be painted. Amell, relatively new to Smiths Falls, has been open a month and candidly admits he knows little about pottery and ceramics but has a strong back-up crew, his mother and sister, helping him. He also says he’s a lifelong learner (and licensed teacher) having been in the education business for close to 30 years teaching in many northern fly-in communities. 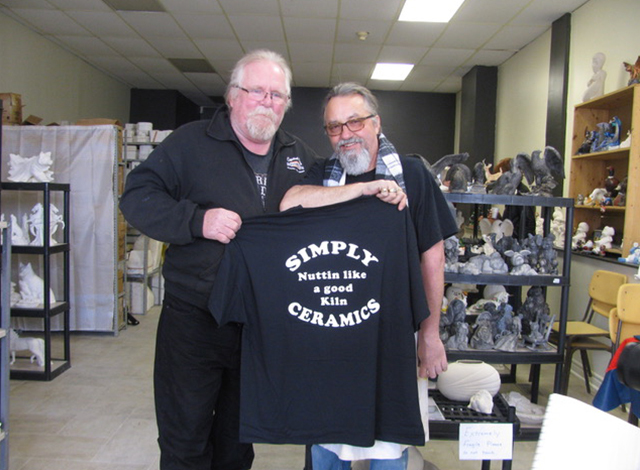 His family is from Prescott and his mother and sister owned a business there (Ceramics+) for over 20 years. After returning south, he convinced his mom to help him with his own business in Smiths Falls — his initial aspiration was to start a real pot store through the pot lottery but didn’t meet the “parameters” — so a pottery store it became. His mother, Sandra McDonald, closed her shop along the St. Lawrence and is now available on a daily basis to help Amell; in other words, it’s become a family business. With his strong teaching background, Amell’s intent is to take his ceramics into schools around town; he says he knows the education curriculum and can link what teachers do in art classes with painting ceramics. As a first-time business owner, he learns something new every day and says, with a grin, “I do what my Mom tells me.” Painting classes are scheduled Monday from 7 to 9 p.m.; students can use Amell’s paints and brushes but have to “buy the bisque”, which, once painted is fired in kilns.For information, give the store a call at 613-402-8066, email him at simplyceramics021@gmail.com, or visit his facebook page. The store is located at 18 Russell Street E in Smiths Falls.